University of Ilorin (UNILORIN) General Studies Unit (GNS) has released the GNS 111, GNS 211 and GNS 311 harmattan semester lecture timetable for 2015/2016 academic session. 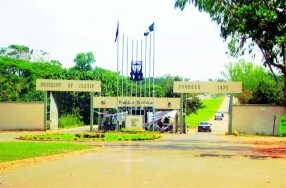 The University of Ilorin was one of the seven institutions of higher learning established by a decree of the Federal Military Government in August, 1975. This step, taken to implement one of the educational directives of the country’s Third National Development Plan, was aimed at providing more opportunities for Nigerians aspiring to acquire university education and to generate high level man-power, so vital for the rapidly expanding economy. The then University College of Ilorin was initially affiliated to the University of Ibadan. Dr. T.N. Tamuno, Professor and Head of History Department at the University of Ibadan, was appointed the first Principal of the College in September, 1975. Shortly after Professor Tamuno’s appointment as Principal of the College, he was appointed the Vice-Chancellor of the University of Ibadan. It therefore, became necessary to appoint another Principal in the person of Professor O.O. Akinkugbe, former Dean of the then Faculty of Medicine, University of Ibadan, in December 1975. The then new Principal, Professor O.O. Akinkugbe, made several visits to the second Military Governor of Kwara State, the late Colonel Ibrahim Taiwo in connection with the new institution, such that by March 1976, he had established residence at Ilorin.